Ever seen a “marble tsunami?” You have now. Here are the specs of the Big Marble Run Machine, as provided by its developer, Jelle Bakker. 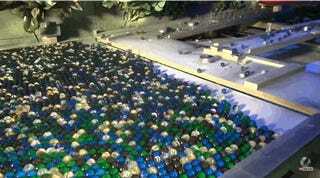 The sound of 11,000 marbles coursing down the tracks was so deafening that Bakker has decided to equip the machine with noise damping housing and glass panels on the front.